(VOVWORLD) - National Assembly Vice Chairman Uong Chu Luu said Vietnam highly values its friendship and cooperation with the UK at a reception in Hanoi on Tuesday for Wayne David, Chairperson of the UK’s All-Party Parliamentary Group for Vietnam. National Assembly Vice Chairman Uong Chu Luu (R) and Chairperson of the All-Party Parliamentary Group for Vietnam of the UK Wayne David. Mr. Luu urged closer cooperation in culture, education, training, and assistance for Vietnamese students to access the UK’s education system. 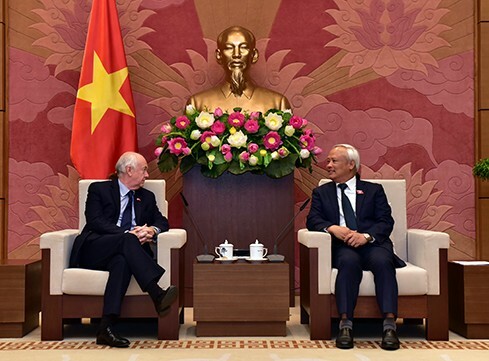 He hailed the outcomes of talks between the UK delegation and the Vietnamese NA Committee on External Relations, several other NA committees, and the Vietnam-UK Friendship Parliamentarians’ Group. Mr. Luu expressed support for strengthening comprehensive cooperation between the two law-making bodies, facilitating visits by parliamentarians to increase mutual understanding and share information and experience in parliamentary activities. Mr. David expressed his profound condolences for the passing of President Tran Dai Quang, and former Party General Secretary Do Muoi. He urged both countries to boost ties to bring practical benefits to their peoples.